May has been a busy month in Stephanie’s Kitchen Garden. Lots of sowing and planting out has been done and the garden has gradually transformed from brown to green as the month has gone on. We are still waiting for the hot sunny days of spring to arrive in our part of East Anglia and the cold nights have caused us some problems, but our crops look healthy and the new harvesting year has begun. As I write this, at the end of May, we are still experiencing some cold overnight temperatures; unusual for this time of the year in our part of the world. Our cold frame is always an important item in the Kitchen Garden in the spring, but this year it has been invaluable. It has been crammed with little vegetable plants waiting for the weather to allow them to be planted in the garden. I certainly wouldn’t be without it. We have planted out tender plants such as sweetcorn, celery and celeriac this month but these have been covered with PVC covers and cloches to make sure they are protected. Our runner bean and climbing French bean plants overstayed their welcome in the cold frame and eventually had to be planted out. Jo had already assembled our pea and bean frame ready for the runner bean plants. After planting she wrapped a layer of fleece around the bottom of the frame to protect the new plants. Despite this, they are still looking a little sorry for themselves so we have sown another batch in rootrainers in the greenhouse as replacements. These will be ready for planting out in early June. Our carrot and beetroot seeds suffered a similar fate. Sown outside in April in raised beds, they have been very slow to germinate so we started again in mid- May and they have at last germinated. 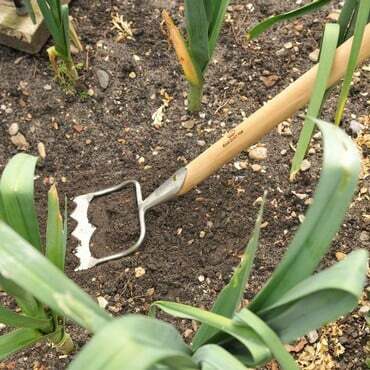 Disasters can hit even the most experienced of gardeners and Mother Nature likes to challenge us sometimes, but one of the best things about gardening is the ability to start again when things don’t go quite the way you want them to. Our cabbage plants have also been planted out into our new cloche system. They were given root boost on planting and cabbage collars added as always. These are tougher little plants so they are not as susceptible to the colder temperatures. 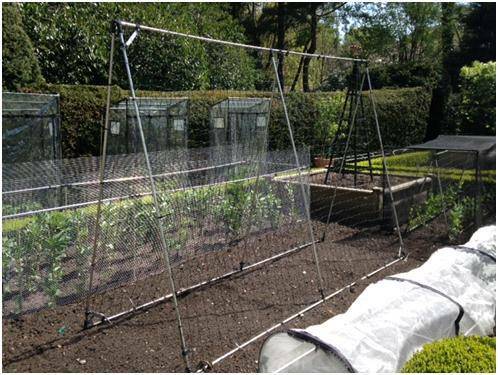 The cloche has been fitted with an insect mesh cover, however, to protect against the caterpillars and whitefly that might attack them later in the season. We always have pests in mind in Stephanie’s Kitchen Garden as they seem to find our plot somewhat attractive! Early in the month, we hung codling moths traps in our apple and pear trees, and raspberry beetle traps in our fruit cage. These are being monitored for signs of these pests so that we can take action promptly if we need to. We have also put up yellow sticky traps in the greenhouse. In the greenhouse, our crops are now in their final growing pots. Flowers and fruit are appearing on the tomato plants and we are regularly feeding them with liquid tomato feed to keep them happy. We are also inspecting them for sideshoots which are pinched out so that the plants can concentrate their energy on producing fruit. Our aubergine plants are now around 30cm high and have had their tips nipped out so encourage them to bush out. They will need to be supported so we will be tying them into canes as they grow. Lovely lilac flowers are now blooming. Our pepper plants are also now beginning to set fruit. Where a fruit sets, the plant forks into two and we nip out one of these shoots to keep one central stem which is tied in to the support. This provides a cordon system and limits the number of fruits which in turn should produce bigger crops. Outside, we have been earthing up our potatoes which are putting on lots of lush growth. Our regular routine of weeding and feeding all of our crops has now begun in earnest. The weather may be challenging for some of our crops, but the weeds are very happy so it’s important to hoe frequently to stop them from taking hold. The rainfall in the garden this month has been sufficient for most of our crops to get away without irrigation. A couple of our raised beds, set against the walls of the greenhouse, have still needed watering along with all of our pot grown crops. Thankfully the water butts are full. The main harvesting season is now in full swing. The rhubarb is coming thick and fast and our chard and spinach plants are providing the kitchen with lots of luscious leaves. Our asparagus has finally come to maturity this year and we have been picking thick juicy spears on a daily basis. Delicious! We’ve also been picking salads and rocket from our mangers. Our watercress crop, sown last month, has really taken off and is now in pride of place in a metal container outside the kitchen door. We’ve also had our first early strawberries of the year. 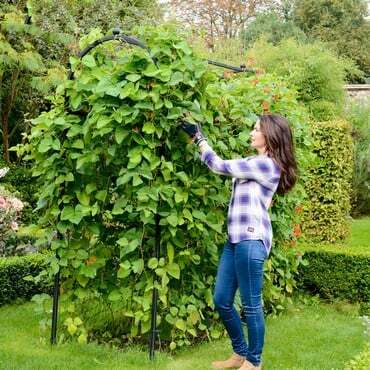 May is a busy month in the gardening calendar and there are always plenty of jobs to be done. When the sun has made a rare appearance this month, we made sure to take some time to sit in the warm sunshine and watch our new bees that have taken up residence in our hive. 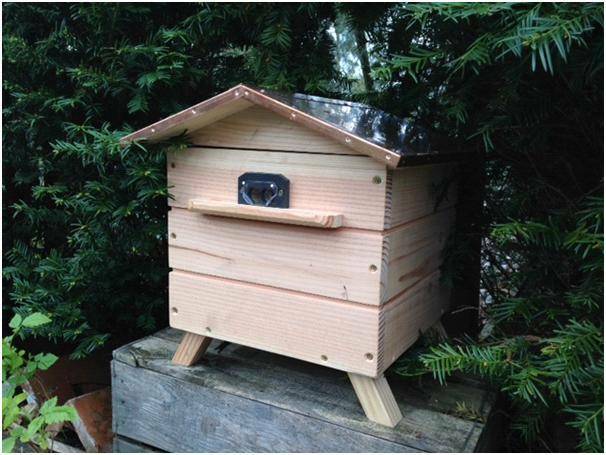 The package containing our bees arrived early in May and they were tucked into their new hive straight away. They have already been busy pollinating our apples and pears. It is fascinating to watch them coming and going - such a relaxing pastime – but beware, hours can pass without you knowing! continue watering, weeding and feeding. We're always here to offer advice and support. Go to the Ask the Expert section on the website and Email Horticultural Advisor Jo Blackwell with your Kitchen Garden queries or Pest Control expert Gavin Hatt and they'll do their best to help!We're busy tweeting about all things Harrod Horticultural - what we're doing, special offers, gardening tips and advice and you can always use Twitter or Facebook to get in touch with us as well. With our webteam manning the Tweet decks and Facebook site, you can be sure you'll get the best service we can offer!Our 108-page Spring catalogue is out now and it's packed full of gardening ideas and products to solve the problems every gardener faces, plus plenty more seasonal ideas for harvesting, storage and preserving solutions.